While I am away visiting my parents in Malaysia, I have asked a couple of friends to guest post for me. 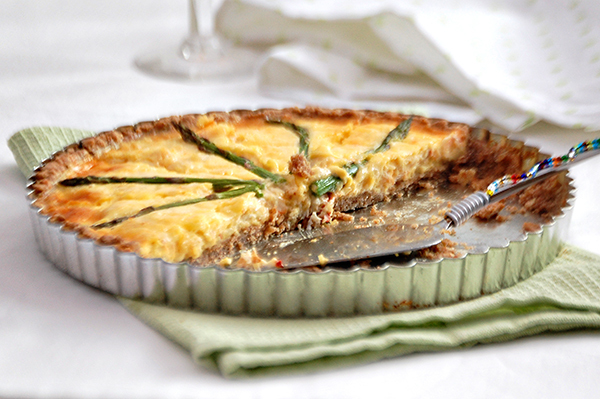 Today, we have Ruby of Tomayto Tomahto with this elegant Crab and Asparagus Quiche. As with most group-oriented activities, blogging tends to create a sense of camaraderie among rookies who started at the same time. After a while we can still relate to the trials and tribulations associated with the time of our start up. I first discovered Ruby’s blog through a friend way back in the “early days”. The title of her blog caught my attention as I often wondered how tomato should really be pronounced. Having grown up in Malaysia with British English and currently living in the Midwest, my accent as you can imagine, is a pretty mixed bag. I was naturally intrigued. I started visiting Tomayto Tomahto and became mostly a silent reader. It was not until the end of last year that I decided to get better acquainted with Ruby when she started her Facebook Fan Page. I am glad I did and we got to know each other a little better. Like me, Ruby is a transplant into her current place of domicile. In her case, it is rural England. We can both relate to the thrills and spills of adapting to a different culture. Naturally, these experiences influence the food that we cook and provide interesting new dimensions to our cuisine. I hope you will visit Ruby soon. 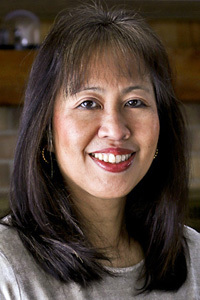 Her posts are always beautifully written with the most interesting stories and anecdotes. It is often accompanied with a tantalizing recipe and gorgeous images. I know you will enjoy them as much as I do. 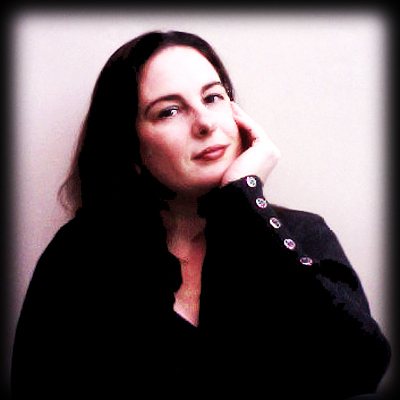 She has a regular column at Honest Cooking – A Bite of Britain. You can also find her on Facebook, Twitter, and Pinterest. I honestly can’t remember when the blogosphere first brought me Biren. She’s one of those faithful blogger friends who seems to have always been there. As ex-pat moms (although of different origins and living in different countries), we already had much in common, but added to that is a shared no-nonsense approach to cooking. That, and the familial warmth that shines through her writing, keep me coming back. Having so much respect for her blogging skills, I was naturally delighted when she asked me to do a guest post! So, thank you Biren, for entrusting me with your readership while you travel. And to Biren’s readers, thank you for giving this your attention even though your beloved blogger is off galavanting around the world. I hope you won’t be disappointed! Here in the UK, asparagus season is almost as eagerly-awaited as the summer’s first Pimm’s. And not just by me. As spring ripens, I often find myself standing in the produce aisle alongside other asparagus hunters tut-tutting at the imported offerings. Peru? Chile? Mexico? 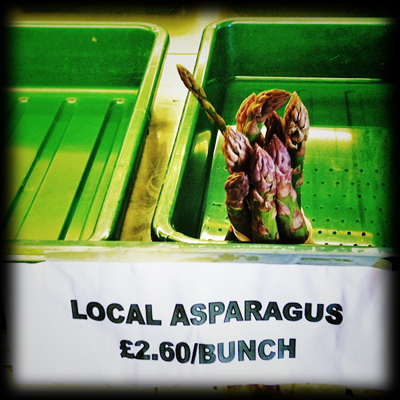 When oh when will the British asparagus be on the shelves? And then, one day it is. And the gorging begins. I can’t swear that British asparagus is any better than that grown elsewhere, but it is definitely fresher when it hits our shelves, and that makes all the difference. I like to showcase it, grilled or barely-steamed, to make the most of the beauties while we have them. But at the very beginning and end of the season, when the pickings are slim, I turn to recipes that use asparagus as a garnish rather than in the lead role. Recipes like my crab and asparagus quiche. Quiche is a wonderful recipe to have in your repertoire because it sounds so fancy, but is really quite simple. It almost feels like cheating, actually, to serve something that looks and tastes this impressive but was done in the blink of an eye. Well, your guests don’t need to know how easy it was. If you don’t tell them, neither will I! 1. You can use fresh (cooked) crab or canned. This time I bought two whole crabs and got the kids involved in cleaning them. They had a ball, even took the empty shells into school for show and tell, and the meat was fabulous. But I’ve also made this with canned and it was perfectly fine. 2. You can take this basic recipe and vary it infinitely. Swap out the crab for cubed ham, or replace the asparagus with baby corn or ribbons of red bell pepper. For an easy Quiche Lorraine, omit the crab and chili and use 1 cup grated Gruyère and 1 cup cooked and crumbled bacon. So long as you maintain the ratio of eggs to cream to filling, you can’t go very wrong. 4. I used a 10-inch tart pan, which gave me a wider, flatter quiche than if I had used a standard 9-inch quiche pan, and with the shallower rim, I wasn’t able to use all the filling. I just used the extra to make another small (single-serving) quiche afterwards. My crust was a bit thick on the bottom, especially in relation to the shallower filling, because I was afraid of making the spelt dough too thin. But it held up great, so next time I will make it thinner, and I’d recommend you do the same, so the earthiness of it doesn’t overwhelm the delicate crab flavor in the filling. Thank you Ruby for a most delightful post. 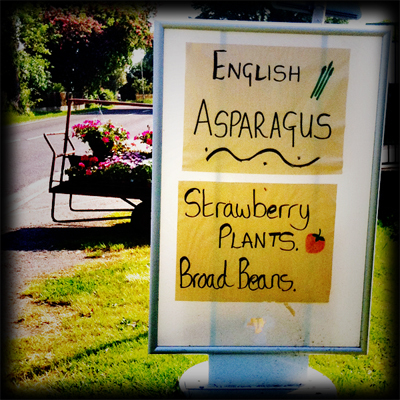 Asparagus is one of my favorite vegetables and I would love to have a slice of your quiche. Hopefully I will get a chance to try out your recipe upon my return. perfectly baked!…yummy n crispy…lov the idea of crab filing! Thank you! I firmly believe crab is very under-used as an ingredient. I just love it! Nice to see you here Subhie. 🙂 It has been a while and I hope you are doing well. Thank you for being such a gracious hostess, Biren, and I hope you’re enjoying every minute of your trip! Hi girls!!! Ruby, there’s a special place in my foodie heart for quiche – it was the first thing I ever baked in that big, scary oven in cooking school when I was a very naive and eager beaver cooking apprentice. It was a classic quiche Lorraine, which would just destroy my hips now! Your elegant and lighter quiche, so beautifully executed, on the other hand, would be just lovely and so much kinder to my jeans!! Biren – I was wondering when Ruby would pop up here! Glad to see she finally made it 🙂 Don’t forget to down some liang teh while you’re there! I feel like I am melting and oil is just oozing out of my skin. I really need that liang teh. Ruby is a sweetheart! 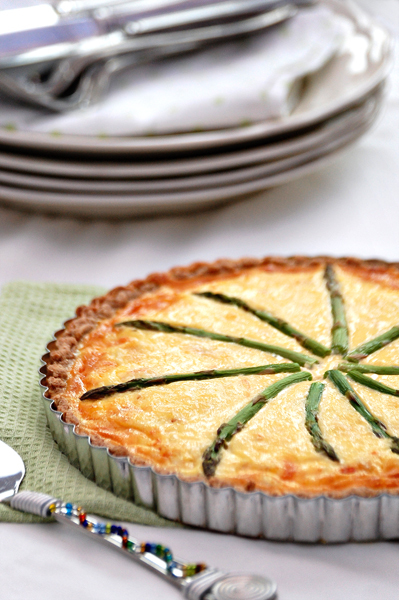 Love this crab and asparagus quiche. Crab and asparagus.what a fantastic flavour combo! You’re so right, Angie! Actually, I can’t believe I forgot to mention another crab & asparagus recipe I posted two years ago, Crab and Asparagus Pasta (http://www.tomaytotomaaahto.com/2010/05/crab-and-asparagus-pasta.html) – I bet you’d like that one too! Thanks, and nice to meet you too Ramona! You have a great weekend too, Ramona! That’s a perfect quiche. I have two really big cooked crabs in the freezer just waiting for a dish like this. Lovely guest post. I really enjoy your writing. Thanks Maureen, that’s so nice to hear! Wishing you a safe and fantastic trip Biren! Nice to meet you Ruby! What a great introduction with this marvelous quiche! Headed over to check out your blog! Crab and asparagus are such a great combo. And I agree a quiche is easy to make, though for some reason people tend not to make them much anymore (interesting how food fashions wax and wane). Very nice post – thanks so much.